Blister PVC Coin cards are trendy yet elegant and make for an excellent branding and marketing collateral. With Ekprint, you can customize these cards by adding your name, logo, quote, address, etc. Choose from a variety of our innovative design templates or upload your own. 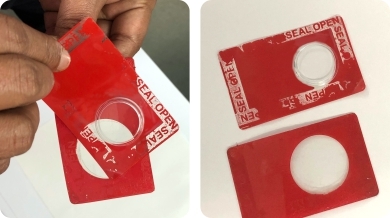 Security print or pattern (as shown in pics) will be totally transferred to each blister card if card is attempted to open, hidden messages like seal open, null, void, security seal or any personal message will appear immediately. This irreversible modification provides evidence of tampering.